The Ancient Egyptian kings went to Sinai for gold, turquoise and copper and the remains of their mines can still be seen. Just before Abu Zenima, a turn off the main road leads past the manganese mines to Serabil El Khadim. There are some abandoned turquoise mines and ruins of a rock cut temple of the 12th dynasty dedicated to the goddess Hathor who was known locally as the mistress of the turquoise. Pharaohs of later dynasties erected many stelaes which are still at the site commemorating their mining expeditions to Sinai. Serabit Al-Khadem is known not for the Temple of Hathor and the turquoise mines alone, but also because it was here that a mysterious script was found, a script that resembles hieroglyphics and appears to have evolved in Sinai. British archaeologist Flinders Petrie concluded that it was invented by a Semite who worked in the turquoise mines in about 1400 BC, using a linear script on the hieroglyphic model. His compatriot, the linguist Sir Alan Gardiner, noted the remarkable fact that at least six of the signs presented appearances that unmistakably corresponded to the meanings of letter-names belonging to the Hebrew and Greek alphabets. Even more convincing of cultural overlapping, one group of four letters -repeated several times - could read as Ba'alat or 'the mistress', the female Ba'al, the name inevitably given by Semites to the Egyptian goddess Hathor. This confirmed that the inventor was a Semite who actually worked in the turquoise mines. 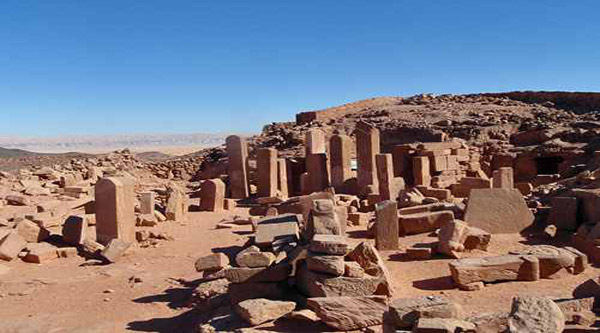 The Temple of Hathor at Serabit Al-Khadem is situated on a 755-metre high plateau inland from Abu Zeneima. 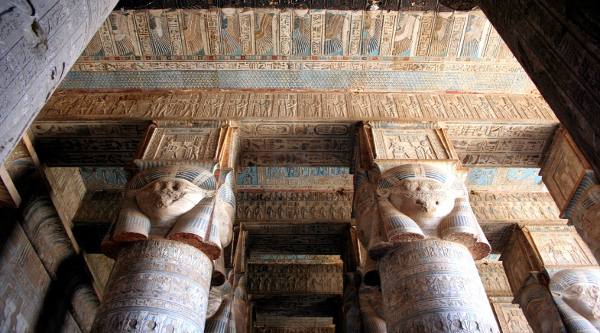 It was built in an area particularly rich in turquoise, a semi-precious stone much in demand by the Ancient Egyptians but of which there is no trace today. Although the earliest evidence of mining dates to an early period, it was not until the Middle Kingdom, especially between 1790 and 1778 BC, that a permanent Egyptian presence was established there. The Pharaoh Senusert developed the site of an earlier rock-hewn shrine known as the Cave of Hathor in which the miners may have placed a statue of their patron goddess. A portico and open court were constructed in front of it to form a temple, from which position rocky trails lead to several small turquoise mines. Naturally there was a residential area for the priesthood, and some of the inscriptions leave no doubt that miners themselves sometimes served as volunteer priests. Expeditions set out from Egypt every three or four years -- annually in times of special need for the precious stone - under the command of important officials, some of whom claimed to be "an acquaintance of the king". The miners mounted rocky trails where they left graffiti of boats and hieroglyphic inscriptions some of which refer to the goddess Hathor as "the lady of the turquoise". They worked each mine rapidly, and when the source was exhausted went in search of new veins, but not before first making offerings to their patron goddess whose temple was successively enlarged and adorned. During the 18th Dynasty, in about 1580 BC, the barracks were enlarged and the Temple of Hathor received attention from Queen Hatshepsut and Tuthmose III. Its orientation was changed when another shrine, dedicated to Sopd, a god of the Eastern Desert, was added at its southern end. 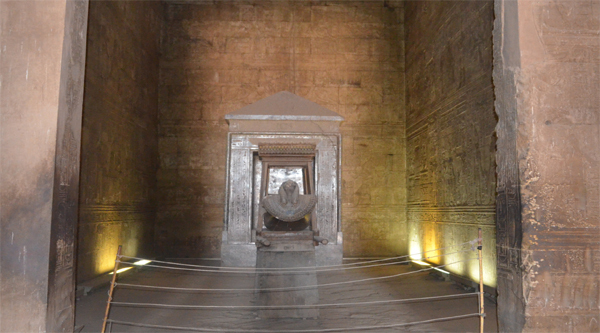 By this time the structure did not resemble a traditional Egyptian temple at all. Courts, pylons and some dozen chambers with roofs supported on pillars can be identified. This was a period of the greatest mining activity in Sinai, and because the Bedouins, who always resented the Egyptian presence, became more troublesome, a small Egyptian garrison was set up to keep watch over their movements. Why the local community should have attacked the miners is difficult to say; perhaps it was for no more than a meagre booty. Nevertheless armed pursuits were made, and records of Egyptian successes were frequently presented in triumphal reliefs inscribed on the rocks - possibly exaggerated portrayals of fairly inconsequential incidents. The mines around Serabit Al-Khadem, along with the now destroyed mines of Wadi Maghera, represented Egypt 's main source of this popular stone, and mining was clearly an arduous task. The men had to crawl through narrow horizontal openings at ground level. The larger, grander mines could hold about 50 workers and in the hot months conditions were almost unbearable, as was described in a text dating from the 12th-Dynasty reign of Amenemhet III. One of his officials was almost in despair when he experienced a desert that " ...burned like summer, the mountain was on fire... ", but, he continued, he fortunately survived and recorded that his mission was successful. When Flinders Petrie studied the temple in 1905 he removed many of the smaller stelae and statues; deciding to leave only the larger stelae in situ.